One of the best ways to see and experience Paris is by walking its streets. That being said, walking for any distance with children can be a challenge. That’s why this Paris walk is the best stroll for the family. It combines some of Paris's best sights in just a short distance. You’ll have a great family experience soaking up all that Paris has to offer while the kiddos get their wiggles out at a playground, a carousel, and a car-free walkway filled with scenic beauty and fun activities. Under the shadow of the Eiffel Tower and just a 5 minute walk from its base, you will find the wonderful playground and carousel in the Parc Champs de Mars. The park includes plenty of green space with benches, playgrounds, a puppet theater, and most importantly, a 100-year-old, hand painted, hand-cranked carousel. For a small fee (2.50 Euro), your kids can try their hand at “spearing” the rings with their baton as they circle on their horses. The attendant cranking the carousel will cheer them on which adds to the fun! This jeu de bagues (ring game) is a children's version of the medieval tournament where galloping knights spear rings with lances. Please note that this is not the fancy, new carousel at the foot of the Trocadero behind the Eiffel Tower near the Seine River. 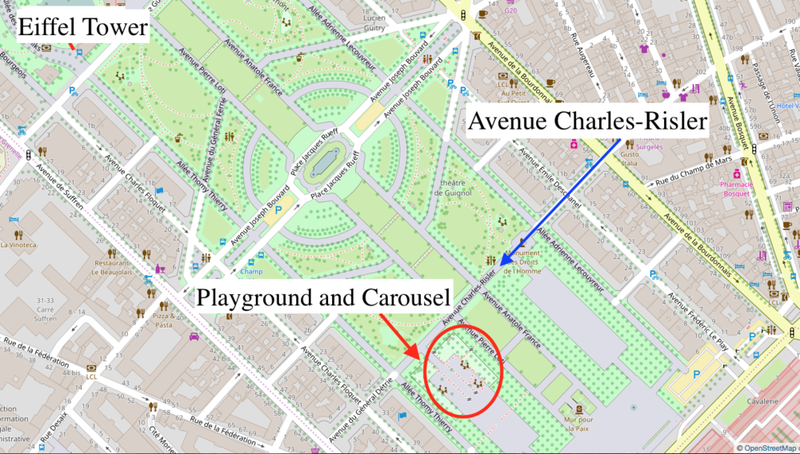 This is the real, authentic, Parisian carousel located off the Avenue Charles-Risler in the Champs de Mars park and accessed from the 7th arrisdonment from Rue de Belgrade. A nice playground and benches are located right behind the carousel. Grab a snack at the stand next to the carousel if you need to refuel before continuing to the next stop. They have crepes to order, sandwiches, croissants, ice cream, coffee, etc. Cafes also line the streets surrounding the park. From the playground, walk about 12 minutes (900 metres) toward and past the Eiffel Tower crossing the street towards the Seine River. You will then walk down the stairs at the right hand corner of Pont d’léna. (FYI: “Pont” means bridge.) This will lead you to a pedestrian walkway that leads to the Promenade des Berges de Seine. Tip: This section is a great photo op with the Eiffel Tower in the background. At Pont de l'Alma bridge, you will access the pedestrian-only, 2.3 kilometer path called Les Berges de Seine. You can access the path from either side of Pont de l'Alma. With no cars to worry about, this stroll is about soaking up the Parisian charm while the kids simultaneously get their wiggles out. This is one of my favorite spots in Paris. Les Berges de Seine leads from the Pont de L’Alma (near the Eiffel Tower) to the Pont Royal (near the Musée D’Orsay), and follows the left bank of the Seine River. This peaceful walk provides a nice break from the hustle and bustle of the city, and you will experience wonderful views and fun play areas dotted along the way. It has a great vibe with all of the joggers, cyclists, dog walkers, and children playing. With climbing walls, fitness equipment, hopscotch, floating gardens, bike stations for rental, snack stands, and shoreline cafes, the whole family is entertained on this walk while enjoying a beautiful stroll along the Seine. Follow Les Berges de Seine for as long as you’d like or make your end point the climbing wall at Pont des Invalides (see pictures below). You could visit Musée de L'Armée from here or continue on Les Berges de Seine to the Musée D'Orsay at Pont Royal. Make sure to bring your camera to capture the beautiful bridges and architecture along the way. FYI: For an even longer stroll or perhaps bike ride, the right and left banks together now form the Parc Rives de Seine, a riverside promenade that takes pedestrians from Pont d'Alma to the Pont du Sully, essentially allowing you to walk or bike from the Eiffel Tower on the Berges de Seine on the left bank of the Seine River and then cross over to the right bank to follow the Parc Rives de Seine, ultimately ending at the Place de la Bastille for a grand total of 7 km or 4.35 miles. Tip: The Batobus (a hop on/hop off water taxi) has a stop near the Eiffel Tower near the Berges de Seine (Pont d’léna), so a riverside stroll could also be a nice activity after a relaxing boat cruise on the Seine. Remember to take your time and enjoy the sights and sounds of Paris! Want More Family-Friendly Activities in Paris? Too busy to read through a million blogs and guidebooks to figure out what to do on your vacation to Paris? Simplify your life with this 6 night Paris itinerary. Our goal is to help simplify your trip planning by sharing all the details you need for an enjoyable family vacation.